Email Address Collector is a fully fledged email address extraction software designed to extract email addresses from the most popular email client programs, such as Microsoft Outlook, Outlook Express or Thunderbird. You can apply extraction filters so only certain emails get extracted and you can save the extraction results as Outlook Contacts, Outlook distribution lists or simply as a plain CSV file. You can download Email Address Collector from here. 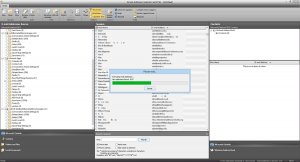 You can extract email addresses from Outlook Contacts in a similar way as described above. But, instead of selecting Microsoft Outlook in the left-bottom panel, you have to select the Contacts menu option. Email Address Collector will display all your Contacts folders in the left panel and you can select from which Contacts folder to extract email addresses from. Along with with Outlook Contacts folders, the program also displays your Outlook distribution lists, so you can extract email addresses from your distribution lists, too. 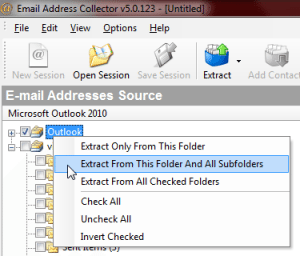 Once you click on the “extract email addresses” button, Email Address Collector lets you choose to extract all email addresses from the selected Outlook mail folders or filter the extraction process. You can choose to extract email addresses only from emails received / sent during a certain period of time, emails that contain specified keywords in their subject line or email body content, emails received through a specified account and so on. You can also choose to extract email addresses found only in certain email fields: in the TO, CC or email body. Obviously, duplicates are automatically eliminated. Once the extraction job is finished, Email Address Collector will display the results in the middle panel. You can then export the email addresses to your preferred destination: Outlook Contacts, distribution lists or CSV files. You can download Email Address Collector from here. It can extract email addresses from Outlook 2000, Outlook 2003, Outlook 2007, Outlook 2010 and Outlook 2013 (both x32 and x64 versions).